I'm opening this post by 100% stating the obvious here, but here it goes: Italy is not, by any means, at all, lacking in good pizza. Pizza -- along with gelato, pasta, cheese -- is synonymous with this country, a constant, consistent presence no matter where you are (while you'd be hard-pressed to find bucatini all'amatriciana outside of Rome for example, you'll find pizza in any and every city in Italy). It's abundant and accessible here, found in the form of pizza al taglio (pizza by the slice) where you can pick up a piece or two of your choosing (margherita? salsiccia e funghi? pizza rossa?) to take away or eat on the go, your wallet only a few euros lighter and your belly a lot happier. If it's a pizza tonda (round pizza) you're after, never fear, there's no shortage of those, either, whether it be enjoyed in a pizzeria with friends (my go-to is a margherita con la bufala) or in the comfort of your apartment as a quick and convenient take away dinner (especially if you're like me and have a pizzeria just around the corner). Pizza here is convenient, universally loved, and consistently delicious, the ingredients fresh, the sauce:cheese ratio perfect, and the crust, whether it be thick or thin, both the perfect vehicle and complement to the ingredients that flavor it. And yet this post is about pizza, pizza that I didn't buy at one of the above-mentioned, numerous pizzerie, but one that I made by myself, at home, crust and all. Which begs the question: why did I make my own pizza at home when I could have spent a few euros to buy one? 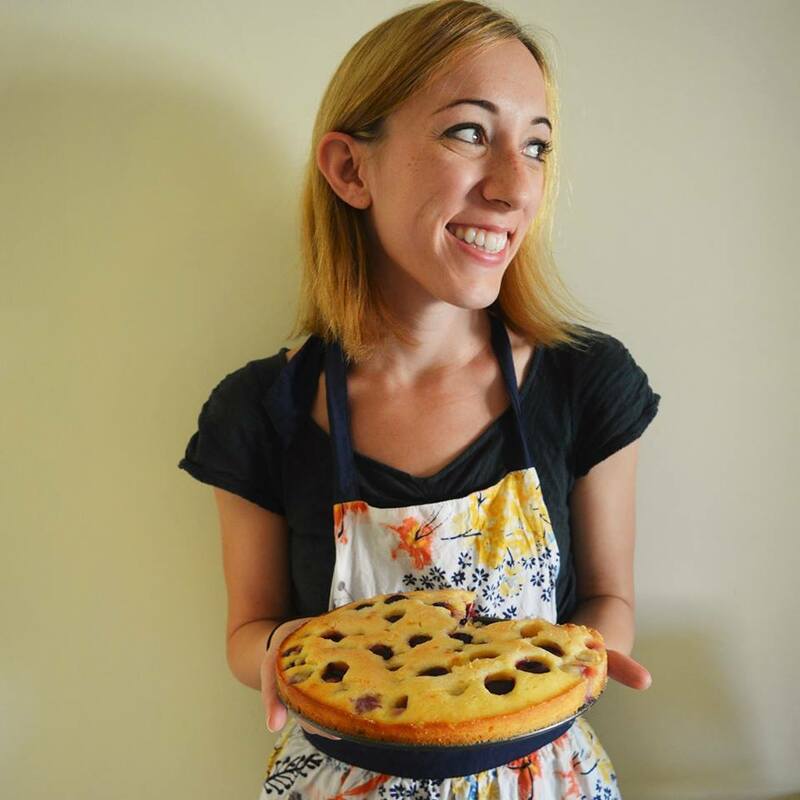 Indeed, you'll find no other pizza recipes on this blog in the four years I've had it -- with so much good pizza to choose from in Rome, I'd never bothered making it from scratch. Ehem. It was a combination of things, I suppose. Spring arrived, and all the best Spring veg -- fave, peas, and asparagus (!!!) had appeared in the market along with it. 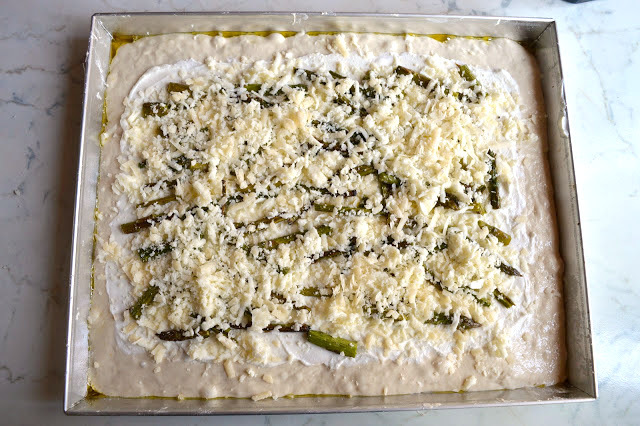 I saw asparagus and ricotta pizza mentioned in an article by Kara Elder for the Washington Post's new site, Voraciously, and the idea stuck with me. 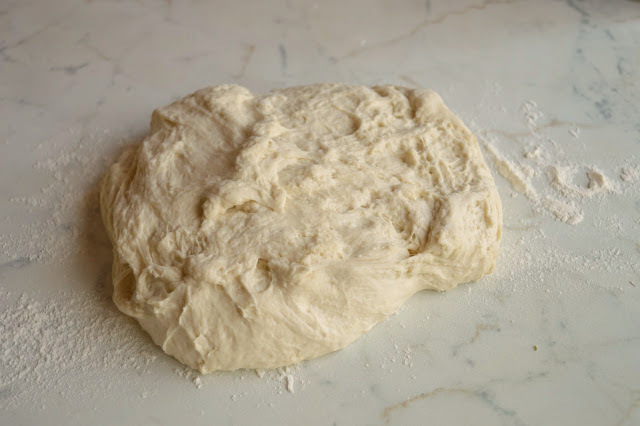 And most convincing of all, I came across this super lazy, very intriguing pizza dough recipe from bread master Jim Lahey, which consists in stirring flour, water, salt, and yeast together in a bowl and leaving the whole thing to rise overnight -- no kneading required! -- before heaping it all into the pizza pan the next day for baking. I had my toppings, I had my mysterious dough recipe, and so I gave making pizza at home a try, and wow, what a pizza it was, you guys. 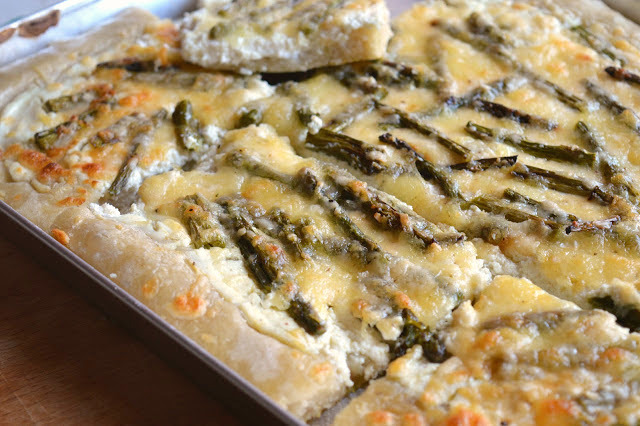 The (absolutely genius) crust was fluffy and flavorful and slightly chewy, and perfect topped with crispy, olive oil-tinged asparagus, whose flavor had become intensely sweet thanks to the roasting. And the cheeses! 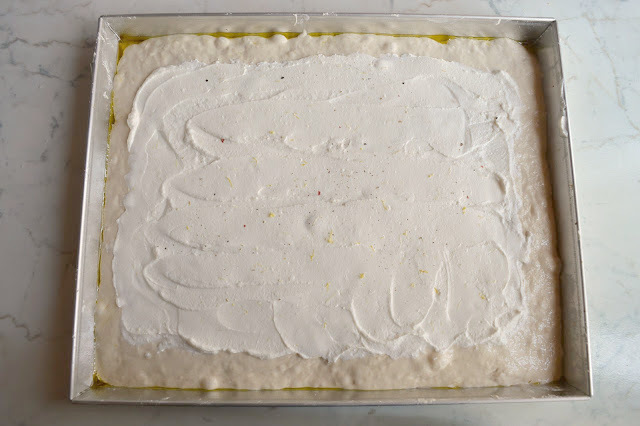 The ricotta was dreamy and smooth with a hint of lemon and a kick of pepper, the mozzarella mild and melt-y and gooey, and both were countered splendidly by a sprinkle of sharp assertive Parmesan which turns golden brown and glorious in the oven. All together, it made for a darn good slice of pizza (or three, or four) especially on a lazy, Spring-y Sunday afternoon. But back to our question: could I have gone to buy pizza for dinner instead of making it myself? Of course! But take my advice here: try making pizza at home, at least once. There is something undeniably rewarding and kind of cool about making it with your own two hands (see also: pizza bianca) especially when it's this ridiculously easy and the result is this incredibly good. 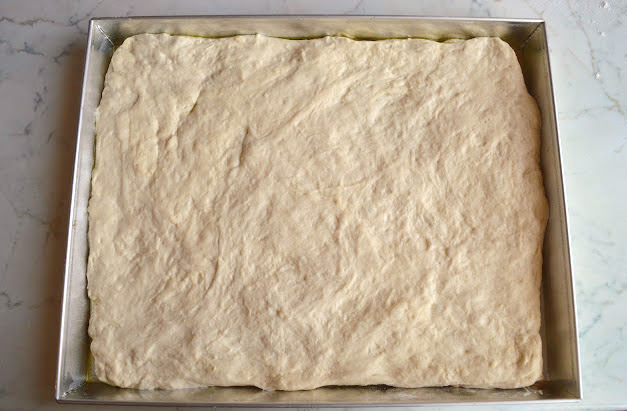 Think about it: it takes just 5 minutes minutes to prep the dough the night before, and when you come home the next day, dinner is halfway done. Once you've added a few toppings the whole thing spends about about 20 minutes in the oven, and voila'! You have a delicious homemade (!!!) pizza in under an hour. 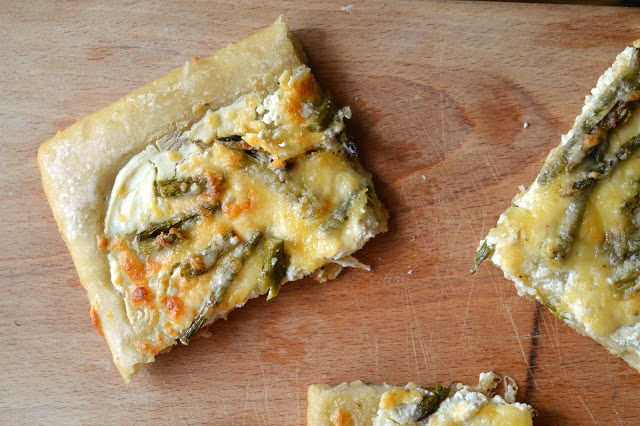 No matter what the pizza situation is where you live, I highly, highly recommend you make this one, and please, feel free to experiment and use whatever toppings you wish (though the ones suggested here are pretty darn delicious). This very well might become your new favorite recipe, as it has mine. 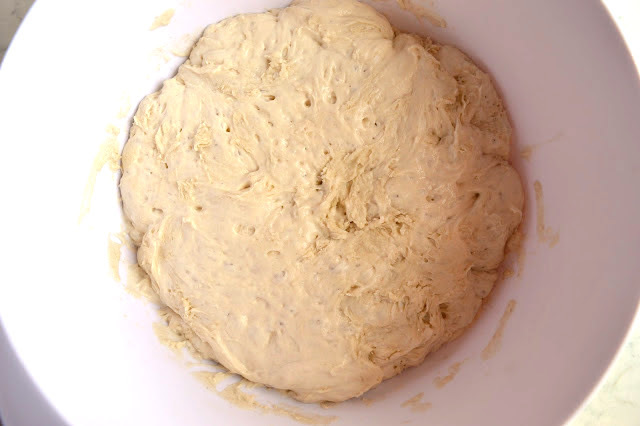 A couple of notes: There are different quantities of yeast listed below based on when you want to make this pizza dough -- thanks to Deb Perelman for posting about this. If you make it 22 hours in advance (starting the evening before for dinner the next day) use 1/8 teaspoon yeast. If you are making it 12 hours in advance, use 1/4 teaspoon yeast. If you are making it 6 hours in advance, use 1/2 teaspoon yeast. * Finally, on all trial runs for this pizza I found that the crust never got really brown and remained quite pale, despite being cooked completely -- this could be my oven or could be the dough itself, but just a heads up if you find its the same for you. When testing this pizza, I made it different ways; I used store-bought from the tub ricotta on one test run, and a nicer, drier variety of ricotta from my local cheese shop in other. The results were different in terms of the consistency of the cheese (store-bought is a little softer while the cheese from my cheese shop was firmer) but both worked perfectly well. On still another test I mixed all the cheeses together and put the asparagus on top, while in another I divided up the cheeses (ricotta; asparagus; mozzarella; Parmesan) with the asparagus on top of the ricotta and below the mozzarella and Parmesan. Both versions worked wonderfully, I leave the choice up to you. Feel free to leave out the lemon zest if you'd like, but it adds a nice bright sunshine-y hint of flavor. Finally, a sprinkle of basil over the top is nice, if you want a little garnish. Looking for more asparagus recipes? I've got this Frittata di Spaghetti e Asparagi, this Asparagus with Gremolata and Burrata, this Panzanella Primaverile. 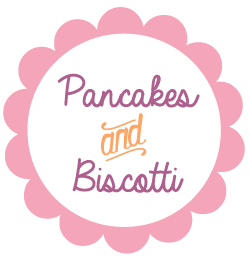 Looking for more Spring-y recipes? I've got this Frittata con fave e pecorino, this Pasta con fave, pecorino, and guanciale, this Torta Pasqualina, and these Carciofi alla giudia. For the pizza topping: Preheat the oven to 350 degrees Fahrenheit (170 degrees Celsius). Take your bunch of asparagus and cut off the tough ends. It should weigh about six ounces when you are done with this. Cut it into pieces crosswise. Place it on a baking sheet and toss it with 1 tablespoon of olive oil and a little salt and pepper. Roast the asparagus for 20 or so minutes (this may take less time or more time depending on if you have the thicker or skinnier variety of asparagus) or until golden brown and delicious. 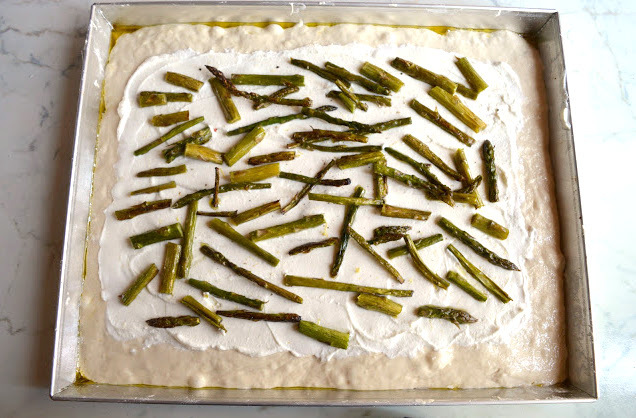 While the asparagus is roasting, prepare take your pizza dough out of the bowl and place it on to a lightly olive oiled 11x13 inch pan, that you've dusted with a little cornmeal. Stretch it out to cover the pan and set aside. Next, stir together the ricotta, the lemon zest, and a little salt and pepper in a bowl. Spread this on to the pizza dough. 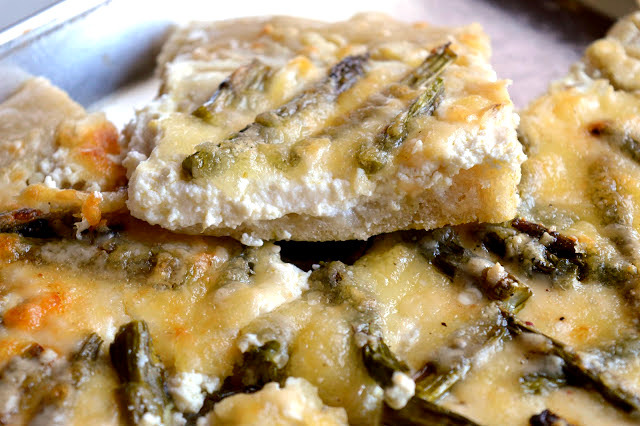 Place the asparagus on top of the ricotta then sprinkle with mozzarella and then the Parmesan. Bake the pizza for 20-25 minutes or until the cheeses are all melted and the crust is cooked and golden brown on the bottom (see my notes above -- it won't get too too golden). Let cool slightly and then dig in. Serves 4.